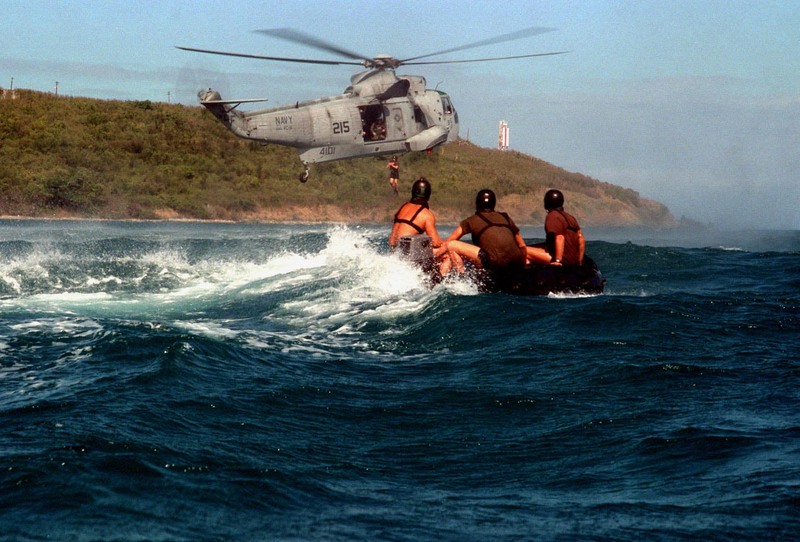 A Explosive Ordnance Disposal technician jumps from a U.S. Navy SH-3H Sea King helicopter into the water as his team mates watch from a combat rubber raiding craft on March 17, 1997. Team members from Explosive Ordnance Disposal Mobil Unit 2 and helicopter crews from Fleet Composite Squadron 8 are practicing insertion and recovery operations off the coast of Naval Station Roosevelt Roads, Puerto Rico. DoD photo by Petty Officer 1st Class Michael Rinaldi, U.S. Navy.